On August 31, 2012 a long filament of solar material that had been hovering in the sun’s atmosphere, the corona, erupted out into space at 4:36 p.m. EDT. The coronal mass ejection, or CME, traveled at over 900 miles per second. The CME did not travel directly toward Earth, but did connect with Earth’s magnetic environment, or magnetosphere, causing aurora to appear on the night of Monday, September 3. 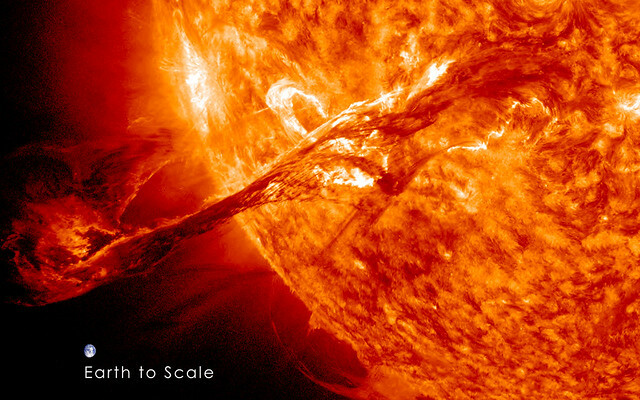 The image above includes an image of Earth to show the size of the CME compared to the size of Earth. This artist’s conception shows the inner four planets of the Gliese 581 system and their host star. The large planet in the foreground is Gliese 581g, which is in the middle of the star’s habitable zone and is only two to three times as massive as Earth. Some researchers aren’t convinced Gliese 581g exists, however. The controversial exoplanet Gliese 581g is the best candidate to host life beyond our own solar system, according to a new ranking of potentially habitable alien worlds. Gliese 581g shot to the top of the list — which was published Thursday (July 19) by researchers at the University of Puerto Rico at Arecibo’s Planetary Habitability Laboratory (PHL) — after a new study marshaled support for its long-debated existence. The exoplanet was discovered in September 2010, but other astronomers began casting doubt on its existence just weeks later. Now Gliese 581g’s discoverers have rebutted their critics’ charges in a new paper, and have done so effectively enough to get the PHL onboard. Even if they can be a major disaster for people nearby them, volcanoes do one good thing: helping to cool the planet by sending sun-reflecting chemicals into the stratosphere. Now two Harvard engineers are trying to replicate the better part of the volcanic process on a small scale by spraying thousands of tons of sulfate aerosols into the atmosphere above New Mexico. ScienceDaily (June 25, 2012) — ESA astronaut André Kuipers is running experiments on the International Space Station that are shedding light on conditions deep inside Earth. Orbiting some 400 km above us, Geoflow is offering insights into the inner workings of our planet. Descending 3000 km under our feet, Earth’s mantle is a semi-solid fluid under our thin outer crust. The highly viscous layers vary with temperature, pressure and depth. Understanding how the mantle flows is a major interest for geophysics because it could help to explain earthquakes or volcanic eruptions. Computers can model it, but how can scientists be sure they are correct? The Air Force’s X-37B–its secret robotic space plane that’s been orbiting the Earth on a mission shrouded in mystery for more than a year–landed safely in the wee hours Saturday morning at Vandenberg Air Force Base in California. Orbital Test Vehicle 2 (OTV-2) is the second X-37B test vehicle to successfully complete an orbital mission and autonomously return to Earth, following sister spacecraft OTV-1’s 225-day mission in 2010.
Who Are The Bankers That Benefit From The Norway Terror Attacks?